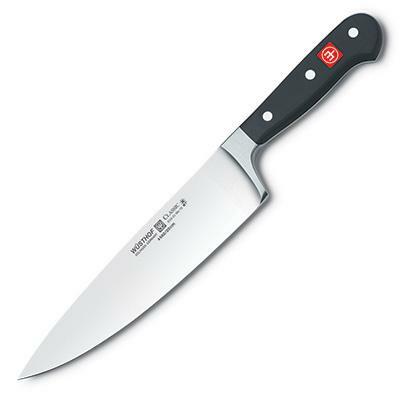 No kitchen should be without an 8 inch cook's knife, and this Wusthof Classic 8" Chef's Knife is by far the most popular choice. The fully forged and perfectly balanced blade is just the right size to tackle any coarse or fine chopping, mincing and dicing of virtually every kind of food. The Wusthof Classic 8 inch Cook's Knife, when held properly, comfortably acts as an extension of your hand and becomes the ultimate manual food processor for fruits and vegetables and even meats. If you are new to forged cutlery and do not have a cook's knife, buy the Wusthof Classic 8" Chef's Knife either on its own or as part of a set. We promise you will always appreciate your decision. Lifetime Wusthof Guarantee. Wusthof item number 4582/20.